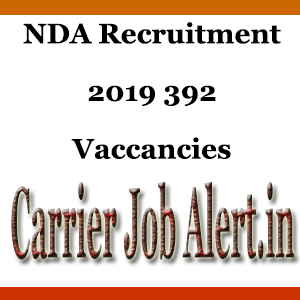 NDA Recruitment 2019 Released through upsconline.nic.in. Aspirants who are Willing to get Government job it will best opportunity. Candidates Who are Eligible can apply through Online Mode. Online Application Starts on 09/01/2019.Online application Closures on 04/02/2019.Here you have read complete article to get a clear idea about notification released. Job Seekers have to Follow Carrierjobalert.in Portal Regularly to get latest Jobs Updates. Gen & OBC Rs 100/-. Candidates Will Selected based on Stage – I (Officer Intelligence Rating tests are Picture Perception & Description Test PP&DT), Stage -II (Interview, Group Testing officer Tasks, Psychology tests and the conference), Medical Examination. VCOAS/Ar My Cdr/Lt Gen (NFSG) : Level 17 (2,25,000/-) Fixed. Date of Exam Will be updated in Portal.